So what was your favorite meal that you made in 2011??? and Why??? Mine would have to be the Paella I cooked this year..It turned out amazing and you can always change the paella with different meats and seafood. Give it a try…Its great for a New years eve platter as well. Next Post BEING SAFE FOR NEW YEARS EVE!! Roasted Red Pepper Sauce with gnocchi! Good luck with your blog! My best was a deconstructed beef wellington – pan-fried fillet of beef with french mustard, served on a puff pastry parcel filled with a mushroom duxcelle. It was accompanied with spinach, triple-cooked chips and a red wine reduction. I’ve only made paella once, but it didn’t turn out too well. I blame the quality of the seafood and my wife for adding extra stock when I wasn’t looking! homemade goat cheese asparagus ravioli in lemon pesto sauce (I talk about it a little on my blog: http://mentalmanna.wordpress.com/2011/10/05/the-best-pasta-ive-ever-had/)! it was a lot easier to make than I had expected and it came out AMAZING! I also threw together a delicious fruit pie dessert with leftover ingredients in my fridge, but details on that one will remain a secret–I’m convinced that one day I’ll open a bakery and they’ll make me rich. Chicken Cacciatore. It’s what my grandmother used to make. Hadn’t made it in a long time. It’s still a winner. Why don’t you post your paella recipe? You have the most difficult part done already – the picture. Thanks for following me! You are my first! I am now following you as well. Since I’m a novice, my favourite meal was a dessert. It was my Chocolate Coconut Macaroons I did for my 100 Day Challenge. Mind you I was suppose to do 10 recipes but only managed 3 😦 One of them was the macaroons which got the most feed back as I baked them for a charity bake sale. Good luck with the blog! OMG! That looks GREAT!! You HAVE to help with that recipe!! (BTW, thanx for visiting Foods for a Happy Body)! We really love people who love good and healthy foods!! 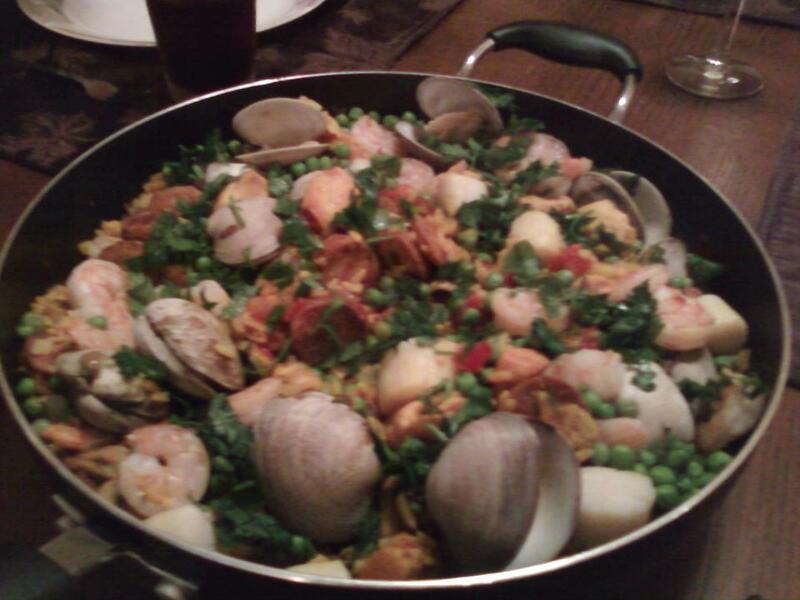 Oooh I need to put paella on my list of things to make! Yum, thanks for visiting my blog, I’m here at yours as well. I’m always looking for fast and easy, low fat recipies. Do you have any of those?